Reacting to omission of his name, Tej Pratap Yadav rubbished speculations about rift within the family. 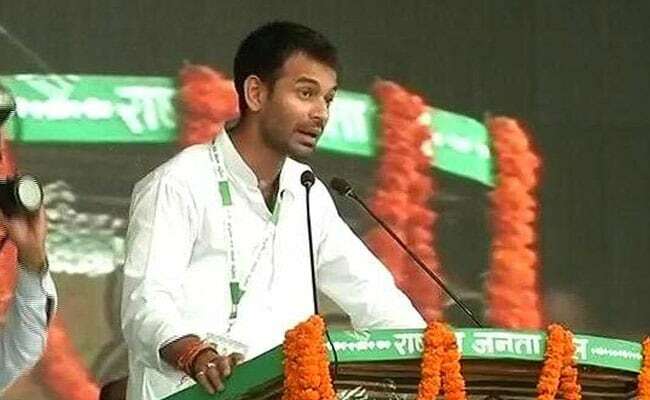 Omission of RJD leader Tej Pratap Yadav's name from a list of dignitaries who would be attending the party's 22nd foundation day celebrations here tomorrow, has added gist to speculations about a rift within party chief Lalu Prasad Yadav's family. However, a number of posters were put up at the party's state headquarters here and the venue of the function, featuring all members of the family currently active in politics. The posters also included Tej Pratap's newly-wedded wife Aishwarya Rai, signalling her possible entry into public life. Reacting to omission of his name, the RJD chief's elder son rubbished speculations about rift within the family. What is so big about my name not featuring in a list of RJD leaders on the invitation card. My name and my photographs can be found on all the posters and banners put up by the party. I will also be taking part in the celebrations tomorrow. All this talk of family feud is a rumour spread by BJP people, he told reporters. But, BJP and JD(U) seem to be in no mood to buy his defence and reiterated growing trouble within the RJD's first family. BJP state vice president Devesh Kumar told PTI there was trouble brewing within the Lalu family which controls the party. While we abhor dynasty politics but going by the Hindu tradition, Tej Pratap who is the elder son of the RJD supremo deserved to be the political heir. But that did not happen, he said. He had to remain content with a cabinet berth when his younger brother Tejashwi Yadav became the deputy chief minister. At present, Tej Pratap is just a party MLA while Tejashwi is the leader of the opposition in the state assembly, the BJP leader said. Lalu also played favourites by getting Tejashwi declared as the party's chief ministerial candidate, leaving Tej Pratap with no choice but to play second fiddle, he alleged. So now, while the three children of Lalu, including eldest daughter Misa Bharti are active in politics, it is Tejashwi who is hogging the limelight. It is foolish to blame BJP for the rift in the family, which is all too obvious, the state BJP vice president added. About Lalu's daughter-in-law Aishwarya's photograph on the posters, the BJP leader said it only proves that in the RJD, you have to be related to the Lalu family, in whatever way, in order to take centre stage. Tej Pratap had tied knot with Aishwarya in May this year. Echoing the BJP leader's views, JD(U) MLC and spokesman Neeraj Kumar said Lalu Prasad has emerged as a neo-feudal force in modern politics. Indeed, there is a rift within the family and that is inevitable when the entire family enters politics and starts yearning for clout, he said. It would be for the first time that Lalu Prasad, who had floated the RJD after breaking away from the Janata Dal in 1997, would remain conspicuous by his absence at tomorrow's function which would be inaugurated by Tejashwi Yadav. Convicted in cases of multi-crore fodder scam, Prasad is presently on provisional bail on medical ground. He is admitted at a Mumbai hospital. According to a statement issued by RJD state unit spokesman Chitaranjan Gagan, top leaders like national vice presidents Rabri Devi, Raghuvansh Prasad Singh and Shivanand Tiwary, state president Ram Chandra Purve, MPs, MLAs and office bearers at district and block levels will be attending the function.